Welcome to Ruma Rima: Welcome Back to Term 2 . . . Welcome Back to Term 2 . . . Welcome back to another busy term! This term our integrated focus is The Arts (Drama, Visual Art, Music and Dance) and we continue our value focus on GRIT! Week one started off by three Food for Thought sessions with Andy from Foodstuffs. 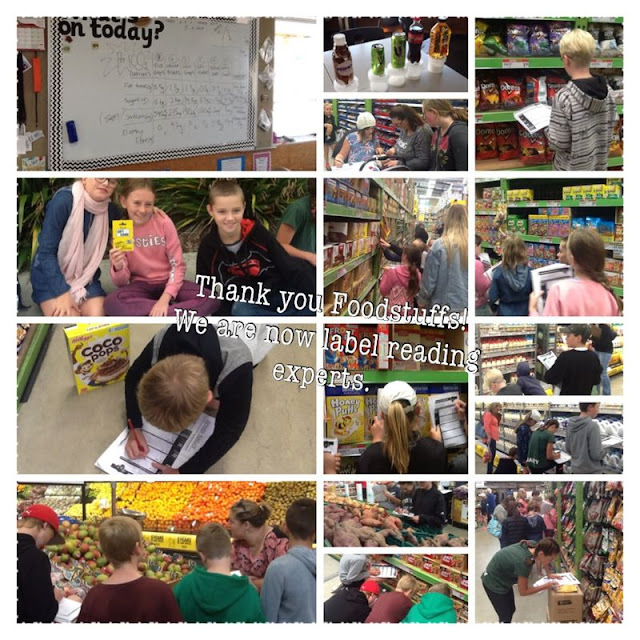 Andy extended our knowledge of label reading with two in-class sessions on nutrition, the food pyramid, label reading and sugar in drinks. The final session allowed us in put all our knowledge into practice at Silverdale Pak N Save. Not only did we learn lots of food and nutrition we received a lunchbox, fridge magnet and $60.00 to spend on a shared kai. Next week in groups of four we will research a healthy snack, write the steps to making the snack, make sure we keep to our budget and then we will make the healthy snacks the following week for lunch! Yum . . .